Sick of formatting? Then learn how to breathe new life into your machines without formatting using the new Refresh and Reset features present in Windows 8 or 10. 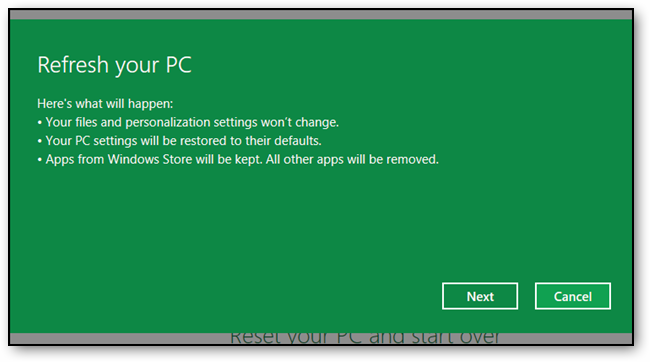 Any application that were not installed through the Windows Store will be removed, however those that were installed through the Store will remain. 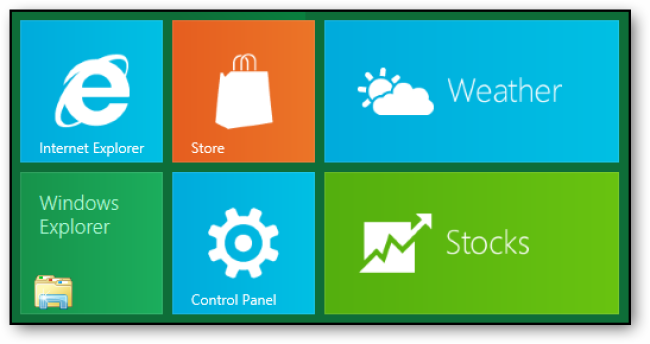 Refreshing your PC can be done either through the new Metro Style control panel or through the classic control panel. We will do it from the Metro Style control panel, as that is that is the new way in which configuration is done. So to get started launch the Control Panel application. 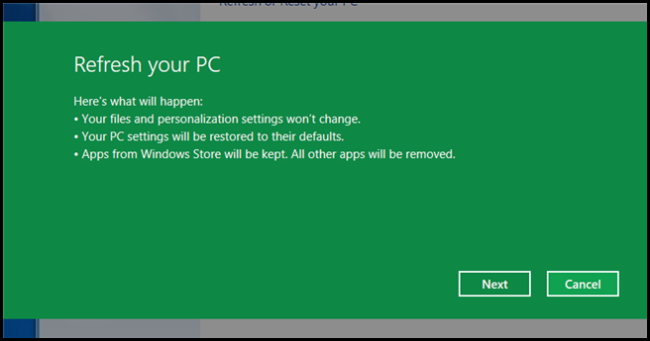 Note: in Windows 10 you’ll need to open Settings from the Start Menu. Once the control panel has opened scroll through the list on the left hand side, until you can select the “General” category. This will load snap the “General” settings panel in, on the right hand side. Navigate to the bottom of the settings on the right. From here we can refresh our PC. 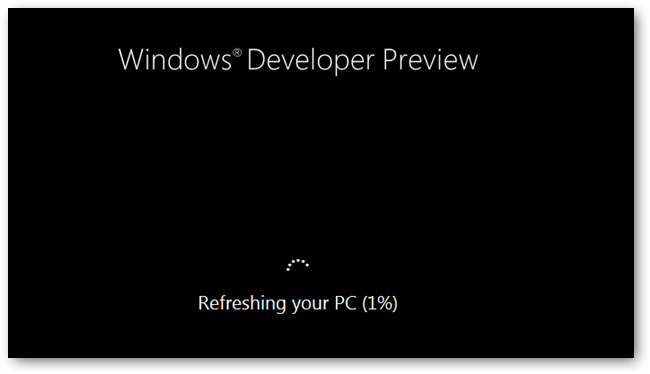 Click the Get Started button to initiate a Refresh. Once you click the “Get Started” button, a banner will inform you on what will be changed. 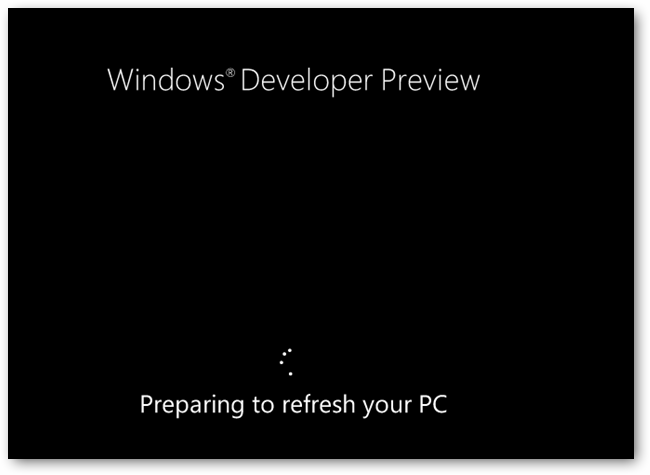 After clicking the “Next” button, you will be informed that Windows will reboot your system. 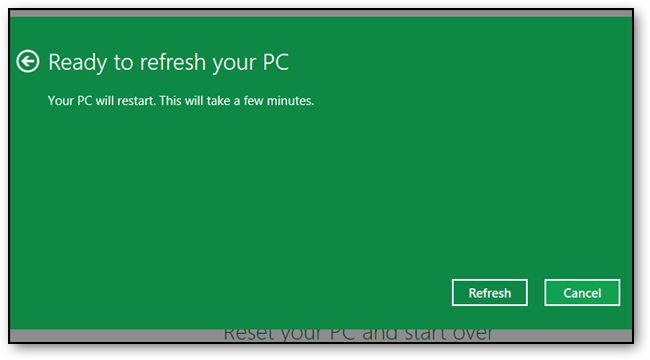 When you ready you can click the “Refresh” button which will restart your PC. When your PC, boot back up it will start Refreshing your system. 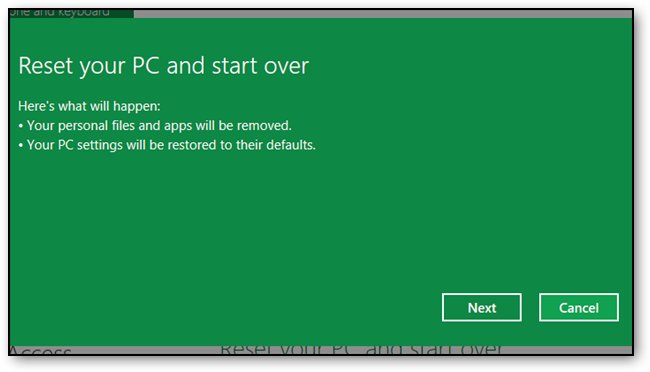 Resetting your PC can be done either through the new Metro Style control panel or through the classic control panel. We will do it from the Metro Style control panel, as that is that is the new way in which configuration is done. So to get started launch the Control Panel application. Once the control panel has opened scroll through the list on the left hand side, until you can select the “General” category. This will load snap the “General” settings panel in, on the right hand side. Navigate to the bottom of the settings on the right. From here we can reset our PC. 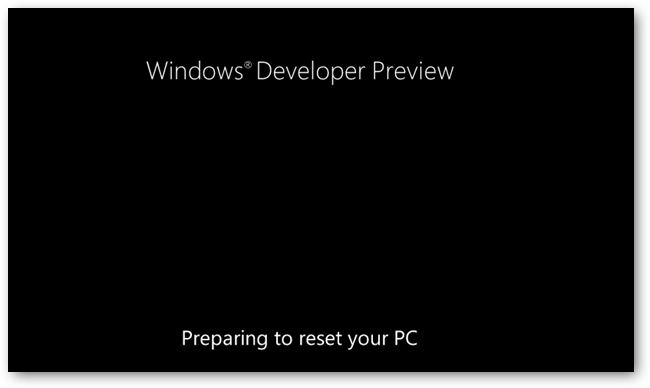 Click the Get Started button to initiate a Reset. Once you have clicked the Get Started button a banner will be displayed across the screen, explaining what will happen to your data and applications. Since we have already explained this you can just click the next button to move on. 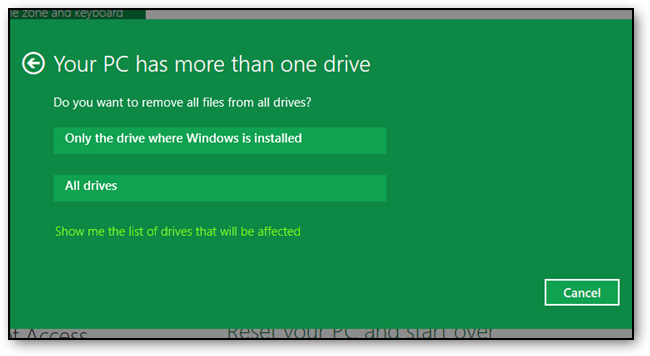 If you have more than one drive, you will be asked which drives you want to remove files from. You can choose either all drives, or just the drive which Windows resides on. 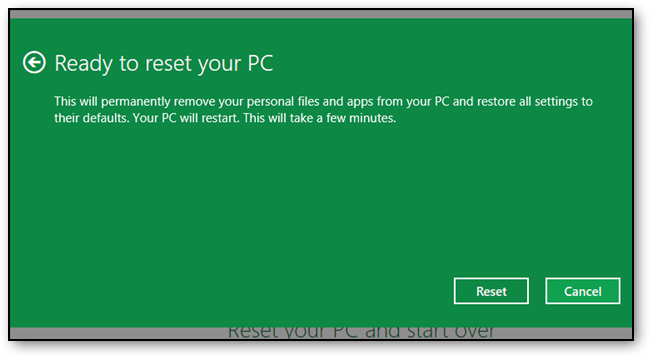 You will be prompted for confirmation that you want to reset your PC. 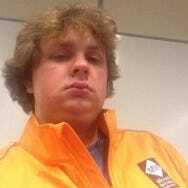 Click the Reset button to get started. Your PC will then reboot. 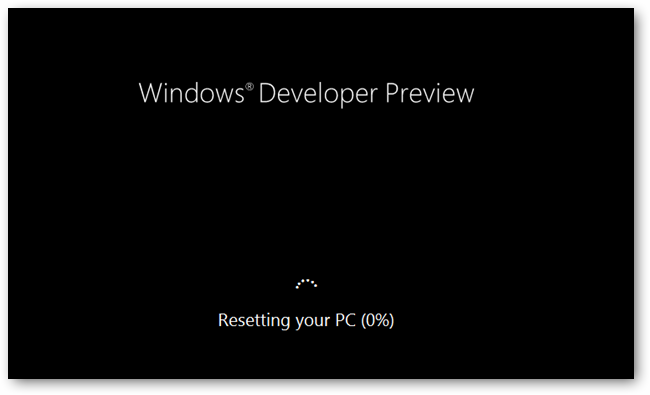 Once it starts up again Windows will commence the Reset process. 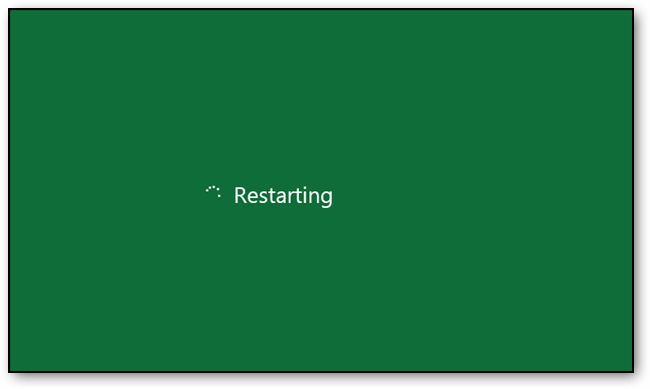 Once it has finished, your PC will reboot once more, this time once it restarts it will appear as you are booting the PC for the first time ever, it will load drivers and appear to be in a generalized state, where you have to create your user account, etc.